Seeing film of our past is like walking through cobwebs; the people and places are hardly there, but oh, how they stick. In his film Of Time and the City, Terence Davies spins a delicate trap that tangles us up in our childhoods. But this raises a question: shouldn’t we try and escape? Sitting in the Philharmonic Hall in Liverpool is like being inside a Bakelite radio; it’s an art deco spectacular designed by the city’s pre-eminent inter-war architect, Herbert Rowse. Having opened in 1939 on the cusp of global chaos, it played a central role in the tumultuous early inner life of the film maker Terence Davies. Not that he was a film maker then; he was a film goer – an obsessive one; in love with celluloid’s emotional gush, he plunged himself into the darkness of city cinemas as a means of finding refuge from the anguish of existence. And it was an anguished existence. It’s all laid bare in the films that have made his name in cineaste circles the world over: The Terence Davies Trilogy, Distant Voices, Still Lives, The Long Day Closes. Between the father who beat him and the Church that damned him, his pleasures were brief but all the sweeter because of it: a trip to New Brighton, the love of his mother, the embrace of those movies. Of Time and the City. The world premiere. October 9th 2008. We sat in the Philharmonic Hall watching the old screen rise; curtains drawn, like a front parlour sealed against the night. Stage lights bled from blue to red, then dimmed as the curtains drew back and the silent titles shone briefly, then faded away. The screen turned crimson, and there in front of our eyes was an image of the Philharmonic stage, the one we’d just been staring at through half an hour of ticket checking, seat taking, smallish talking. And on the screen, an image of the screen began to rise, curtains drawn still. The curtains opened and the film began to play – on an image of the screen on which we watched the film. We saw the Liverpool overhead railway, a city transit system that was closed in 1956. It trundled through the Liverpool of Terence Davies’s youth, flickering on an image of the screen that in reality was catching light right in front of our eyes, and two eras merged for a moment, before those black and white days won through and we were transported into the past. His past. 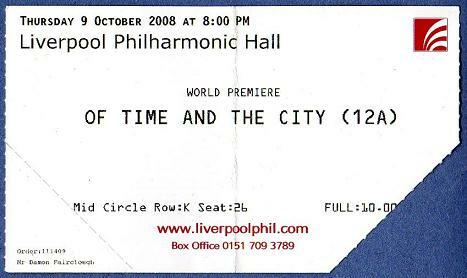 The past of the man we’d just cheered to the roof of the Philharmonic Hall. Terence Davies, the toast of Cannes, now the bread and dripping of a long lost Liverpool of the mind. The film is a network of thoughts; its connections and recollections are triggered by archive material, sequences of Liverpool and its people from the 1930s through to the 1970s. The earlier footage throbs with humanity; ferries spew passengers in torrents, a swimming pool is carpeted with bodies, streets are crusty with the salt of the earth. As the images shift from black and white into colour their vitality should be intensified, but that’s not how the story pans out. The coming of colour coincides with a creeping of concrete, of the waves of humanity being parted, swept back and built up. We enter the era of my own childhood; a lone figure in a pitch-invasion jacket; a spectre with a pushchair; the writing is on the wall. Imagine these words playing over visions of cake crumbs and doilies, drizzle down the window, an electric heater plugged into a light socket. Hair shiny with Brylcreem, and butter on the ration. A lost sequence from Of Time and the City? Of course not. For Terence Davies we gather there was never a Norman, however hard he may have wished. Oh, how he wished there could have been seductions. In Of Time and the City, there is a smouldering moment as a bonfire burns, and Davies remembers a Guy Fawkes’ Night seared onto his memory. Flames licked the sky; young Terence placed his hand on his friend’s shoulder. His friend was Jimmy Preston, “a real boy”. There were fireworks, but only Terence saw them, felt them. Wanting more, he urged, “Don’t go in just yet. Not yet…”. But Jimmy did go in, and was gone. Terence’s passions burned on, but without fuel to consume, the combustion was incomplete. I am standing outside the Leadmill, Sheffield, in a time that is not now. The group of friends I have been with has dispersed leaving me and… another. We tell each other we should share a taxi, but I don’t want a taxi. I want to walk, simply because it means more time with her. So while I say yes, a taxi is what we should look for, I really mean no, I hope a taxi never comes. We wander towards the dual carriageway, up past the car showroom and down into the underpass. I steer us towards a route with reduced cab potential; whether she realises and silently assents, or simply drifts along by my side I’ll never know. Because though my taxi avoidance is a success, I am powerless to hold back the end of the night. I am Canute in Doc Martens. Morning’s waves crash over me. As he finished the line, my throat closed up. I leapt a little from my seat, such was the shock of the emotion I felt. My hands slapped together but applause was not enough. I wanted to yelp, to cry, to turn to those around me and share the sensation, the feeling of someone tapping into your senses and siphoning your soul. This film, you feel, is Terence Davies attempting to do much the same as Mitchell. To turn to us and say – quoting Chekhov – “The golden moments pass and leave no trace.” Ultimately of course, he is right. The millennia stretch ahead, the echoes of aching moments having reverberated out of existence. But right now, the traces are real enough; he imprints his Liverpool past on minds that are moved, possibly to tears, by his professed vulnerability, his helplessness in the face of this monstrous melancholy. Walking away from the Philharmonic Hall, we take the traces with us and meld them with our own… and are perhaps unsettled by our own inability to match his talent. As the creator of sublime moments of cinema that are trumpeted across the globe, would that we were all so helpless. Having stepped out into Hope Street we walk a little, find the car, fire up the engine and drive away. Back to our children, deep in their own golden moments, that we are part of. True enough though the film is, it’s in the present that we must make the most of things. It’s happening right now: life, while we make other plans. Somewhere, there’s the place where we began: a house, a street, a neighbourhood, a city. We inhabit these spaces as in dreams, because that’s what they will become. Dreams of the life we once lived. Not to be regained. But, if we’re lucky, to be passed on.